Lethbridge County is considering a request from Picture Butte to provide financial help with their new community pool. During their regular Nov. 1 meeting, Lethbridge County council met with a delegation from the Town of Picture Butte to discuss support for the new Picture Butte community pool. Picture Butte CAO Keith Davis, speaking on behalf of the delegation — which consisted on Picture Butte Mayor Cathy Moore and coun. (s) Joe Watson, Henry de Kok, Teresa Feist and Cynthia Papworth — started off their presentation by explaining that the pool that they are replacing had been in place for over 55 years, and had suffered from issues such as the pool basin leaking and structural issues in the pool building. “We’ve already completed two renovations in that lifespan, so we felt that doing another renovation on the pool basin was not worth the investment on such an old piece of infrastructure,” said Davis, adding it wasn’t meeting the current code for pools. Additionally, there wasn’t an area for families to enjoy themselves at the pool out of the water, as the area was concrete and wire, resulting in the facility being underused. As the pool wasn’t meeting families’ needs, a group within town wanted to build a spray park. “We’re been able to channel that interest and dedication towards the pool rehabilitation — we knew we had to do something with the pool, and we didn’t want to build another piece of infrastructure that was going to drive people away from our pool,” said Davis. As the pool facilities had “completely” outlived their lifespan and caused people to go somewhere else for their pool needs, council made the decision to replace the pool in their 2018 budget deliberations. Although the option of building an indoor pool was considered, it was determined to be too expensive for the town to justify, for both capital and operational costs. Davis said the best-run indoor pool in southern Alberta had an operational deficit of “at least $125,000”. The town decided to go ahead with an outdoor pool, which was more realistic with their tax base. Council had initially approved a $1.6 million budget for the construction of a new pool, a toddler pool, building and play features. As the town didn’t have the staff capacity to oversee aspects of the project such as design, construct and quality management, a tender was put out for project management, which was eventually granted to a company called Tango. A conceptual design tender was when put out, and was granted to VDA Architecture, who then designed three options based on different budgets. Those went to a cost estimator, to give the town a better idea on what those designs would actually cost. 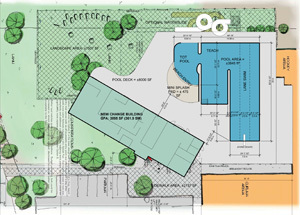 An open house was then held in June for the public to vote on which design they would prefer to see and provide feedback, and the open house attendees voted overwhelmingly in favour of the design with the most features, including an expanded tots area, beach entry and a mini splash-pad. The cost estimate for that design was reported to have come in at around $3.9 million. According to comments made on feedback forms in favour of it, respondents believed it would serve a greater age range, had more to offer then the other options and believed that if the town was spending the money for a new pool they should get it right and go big, especially if it won’t be replaced for an expected 40-50 years after its built. The pool building was demoed, and the town put out a design build tender process, which was awarded to Premiere Custom Homes, a local contractor, and they will be using Master Pools to construct the new community pool. Davis said that during the design build process, they were able to reduce some of the costs, and now estimate that the project will come in around $3.7 million, including project management, construction and a $300,000 slide that the town included in response to community feedback. To fund the costs of building the pool, Davis said they were applying to grants, such through as the Community Facility Enhancement Program, which provides up to$1 million in match funds, and the Investing in Canada Infrastructure program, a federal initiative that has the federal government funding 40 per cent of the project, the province providing 33 per cent in Municipal Sustainability Initiative (MSI) funding and the municipality 27 per cent. A prominent community member, Cor Van Raay, had donated $1 million towards the new pool in September. The town also has a community fundraiser planned for the pool, which they expect to happen in March 2019. Any shortfall in funding would be picked up by debenture by Picture Butte residents — something Davis said would be “worst case scenario”. Land owned by VRP Farms next to the community center had also been donated for the new pool. Davis said the reason the town was approaching the county to ask for funds was because over 3,000 county residents — based on population numbers from Stats Canada —utilized the pool in Picture Butte, and it would be the closest and most convenient pool facility for them to access. Davis acknowledged that the county might be reluctant to provide funding for the pool, and other communities might start demanding for funding for their projects. However, the nearby towns of Coalhurst and Nobleford do not have and currently have no plans to put in pool facilities in their communities, and it could be argued that by investing in the pool, they are serving county residents within a 30-minute drive of the town and north of the winter. Coun. Tory Campbell asked if they had approached other municipalities over the project, to which Davis replied that the county was the first on they’ve talked to. The Town of Picture Butte currently has plans to talk to the Town of Nobleford. Coun. Klass Vander Veen asked if the town would be building a swimming pool if they didn’t have those county residents potentially accessing it as well. Davis noted it would be “hard to answer that one”, as they consider their facilities as servicing both the town and the county residents, as they have historically, and expect it to continue into the future. Council unanimously passed a motion to refer the presentation to administration for a report, to be presented during 2019 budget deliberations.